Two versatile channels with plenty of gain. 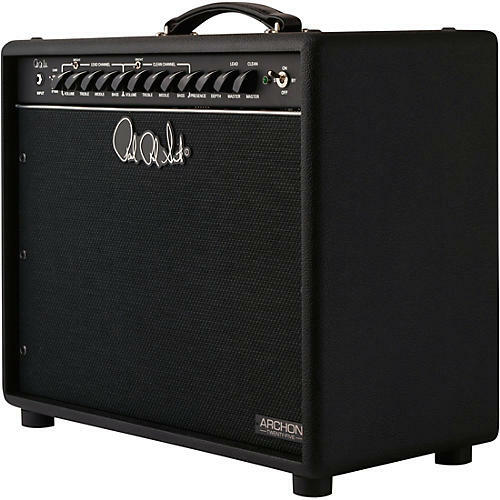 The Archon 25 brings the king of PRS high-gain amplification to the world of small, low-wattage tube amps. The Archon’s lush distortion and singing clean channel tones are all here in a 25 watt package (switchable to 13 watts via the back panel). The Archon 25’s wattage makes the amp easier to push to optimum performance – tube amps sound best when pushed a little – and it gets there at a lower volume, which is a huge benefit not only at home, but also in the studio and on the stage. Recording with an amp at lower volumes will give you a cleaner signal and a truer tone, and on the stage, the soundman will thank you for not blowing out the other members of the band. The Archon 25 features Volume, Treble, Middle and Bass controls for each channel. There is also a Master Volume control for each channel and global Depth and Presence for added control. The Archon’s 6L6 tubes are replaced here with 5881s, which offer extended high end while maintaining the Archon’s signature crunch.